Rihanna turns down halftime Super Bowl performance! Reports suggest the artist turned down the opportunity 'in support of former NFL star Colin Kaepernick'. According to US media, Rihanna was asked to headline at next year's Super Bowl halftime show, allegedly turning it down 'in support of former NFL star Colin Kaepernick'. The Super Bowl is typically the most watched event on TV in the United States annually, with the halftime show of Super Bowl XLIX (2014), with Katy Perry as the headline, peaking at 118.5 million viewers. Colin Kaepernick was one of the first National Football League player's to kneel during the US national anthem, a controversy that first appeared within the NFL preseason in August 2016. Players who took a knee during the anthem stated they wanted to draw attention to racism and police brutality. According to reports, Rihanna was the first choice to headline next year's Super Bowl halftime performance, but she turned down the offer partly due to the issue that Kaepernick hasn't been played in the NFL since early 2017. 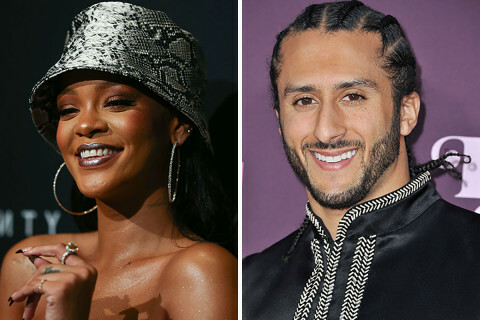 Anonymous source within a report posted by Entertainment Weekly stated that "Rihanna was the front-runner for next year's super bowl halftime show,"but she declined due to"[standing] with the players and Colin Kaepernick". Reports also suggest that Pink was approached to be the headliner for the half time show, but also declined as negotiations went on for too long. Maroon 5 have now been confirmed as the headliners for the show, which will take place on February 3 2019 in Atlanta, Georgia. Are you for or against kneeling during the National Anthem? To be Honest Kneeling during a National anthem is both Respected and disrepectful depends on the situation. In this case regarding the Police brutality and racism i agree people should be able to kneel for the national anthem in respect.